When everyone is depending on you to take accurate notes, choose Office Depot steno books. These steno books offer both quality and value, so youll be prepared the next time an important meeting takes place. 15-lb paper is center ruled. Durable chipboard backing provides a firm writing surface. 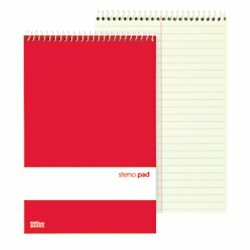 These Office Depot steno books feature 140 pages per book. 15-lb paper is center ruled. Durable chipboard backing provides a firm writing surface.